Soak skewers in water for two hours or longer. If using an outdoor grill, heat to medium heat. Or use a ribbed grill pan on your stove. In a medium bowl, mix all ingredients except lamb until combined. Then add lamb and mix just enough to combine without over working the meat. Form into seven oval shaped patties. 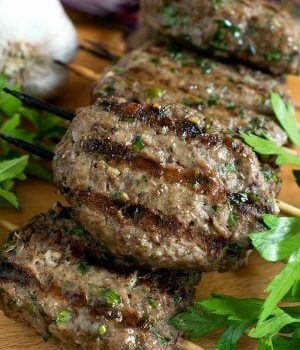 Place two skewers side by side into each. (Two makes it easy to flip on grill). Gill over medium heat flipping halfway through to a nicely seared exterior and cooked to your liking on the inside. We cooked ours to medium which took about 12-15 minutes. To serve, place one or two patties on open flat bread and top with shredded lettuce, chopped tomato and a generous drizzle of Tzatziki.